Opening in the summer of 2018, Universal's Aventura Hotel will welcome guests to a "sleek and stylish space designed to create an affordable-chic experience in the heart of a vibrant and relaxing resort atmosphere," it has been announced. 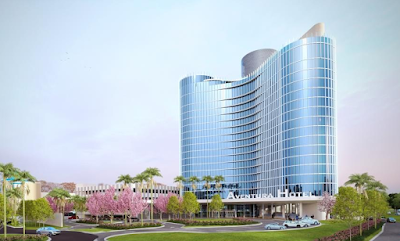 The new hotel will have sixteen stories with a total of 600 rooms within the glass enclosed tower, using a small space to again expand the amount of rooms at Universal Orlando - hitting 6,200 when Aventura Hotel opens. Aventura Hotel will be a departure from the themed resorts already open at Universal Orlando, instead offering a clean, modern design meant to attract a "value-savvy traveler." It will feature early theme park entry for guests, but no free Universal Express Passes as featured at some of the higher-end on-site resorts. 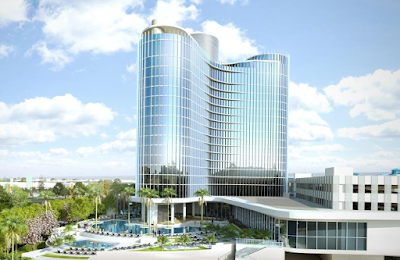 It will, however, have the resort's first rooftop bar and grill, offering guests the ability to enjoy "small plates and craft cocktails while taking in incredible panoramic views of Universal Orlando and the surrounding tropical landscape." Other amenities at Aventura Hotel include a modern food hall with five quick-service outlets located just off the lobby, gift shop, on-site car rental, fitness center and pool area with a relaxing hot tub and splash pad areas for kids. 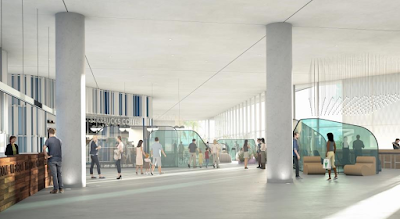 While no renderings of the actual rooms were released yet, press materials describe them as embracing "a serene, modern environment with refreshing, natural colors such as sea blue and rose, and floor-to-ceiling windows offering sweeping views of the destination." The hotel will be next to the Sapphire Falls Resort and across the street from Volcano Bay. The release of additional information and the start of reservations for Aventura Hotel will begin in early 2017.